The Pyramids of Giza are undoubtedly the most iconic symbols of Egypt and indeed the ancient world. Situated near the sprawling capital city of Cairo, the pyramids are thought to have been constructed between 2550-2490 BC during the reign of three different pharaohs. In ancient Egypt, death was not feared. In the case of Kings, it was widely believed that death was simply the next step toward eternal life and that this transition would see them become gods themselves. In order to prepare for this journey, the rulers of ancient Egypt built pyramids as tombs and filled them with things they would need in the afterlife. Antiquities thought to have been left in the tombs were items such as canopic jars, amulets, chalices and statues of various gods. The Giza complex boasts three large pyramids, as well as several small pyramids dedicated to various queens and two cemeteries for important members of society. The Great Pyramid, towering at a mighty 147m, was constructed by King Khufu and was the first built at Giza. Made of limestone transported from nearby quarries, experts estimate there to be 2.3 million bricks in Khufu’s temple alone. Visitors are allowed to get up-close with the structure and for a small fee are encouraged to enter. 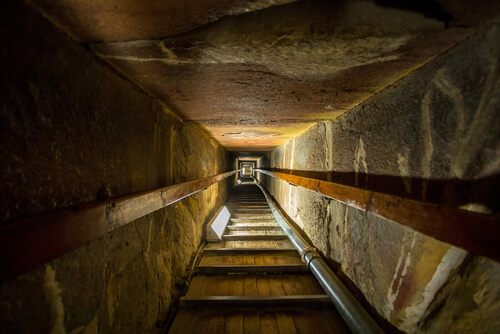 After winding your way through a narrow tunnel and up a steep set of stairs, you’ll come to the bare main chamber of the pyramid, housing only a lid-less sarcophagus. In ancient times, elaborate and multi-layered sarcophagi were built to protect the bodies inside tombs and the precious items inside. However, Egyptologists believe that the pyramids and other tombs throughout Egypt were heavily looted, particularly during the New Kingdom period when Giza was replaced by the Valley of the Kings as the primary royal burial site. This theory explains why no mummies or goods have ever been found inside the Pyramids of Giza. Wandering through the site, either on foot or with the local method of transport – on camelback – you’ll come to the second pyramid. This one was built by Pharaoh Khafre, the son of Khufu. His tomb complex also includes the famous Sphinx — a large figure with the head of a Pharaoh and the body of a lion — which was thought to be there as a custodian. The third and significantly smaller pyramid was built by King Menkaure in the early 25th century BC and featured a more intricate inner complex than the other two pyramids. 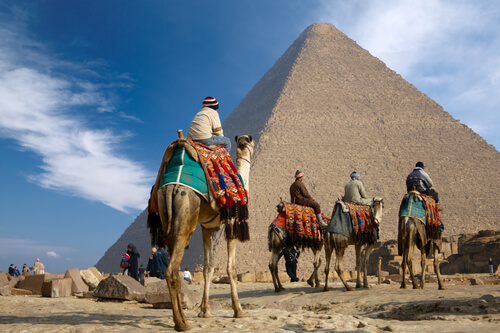 The Pyramids of Giza are the last of the Seven Wonders of the Ancient World and are truly a sight to behold. Venture to the plateau, explore the tombs and prepare to be amazed by the theories of their construction.